Hedgehog Hotel (ITV, 5.30pm) Wildlife special following a group of rescued hedgehogs. John Bishop's Gorilla Adventure (ITV, 9pm) Documentary where the comedian visits the forests of Rwanda to observe mountain gorillas. Gogglebox 2015 (Channel 4, 9pm) A selection of the show's best moments from the year. Michael Palin's Quest for Artemisia (BBC4, 9pm) New celebrity travelogue where the former Python star investigates 17th-century Italian artist Artemisia Gentileschi. Storage Hunters UK: Celebrity Special (Dave, 8pm) Bob Mortimer, Kimberly Wyatt, Ross Noble & Jimi Mistry participate in the reality show about storage containers and the riches and rags that could lie within. ★ David Beckham: For the Love of the Game (BBC1, 9pm) Documentary following the sportsmen as he attempts to play a football match on all seven continents, raising money for UNICEF. A Life on Screen - Stephen Fry (BBC2, 9pm) Profile of the comedian, author, actor and broadcaster. 8 Out of 10 Cats: End of Year Special (Channel 4, 9pm) A look back at the year's funniest stories. Big Star's Little Star: Christmas Special (ITV, 8pm) Celebrity contestants are Fiona O'Carroll, Robbie Fowler & Michael Vaughan. Hosted by Stephen Mulhern. What Britain Bought in 2015 (Channel 4, 8pm) Documentary where retail consultant Mary Portas looks back at how British consumers spent £6bn on each week in 2015. ★ Charlie Brooker's End of the Year Review (BBC2, 9pm) Satirical look at the past year's events. It'll Be Alright on the Night (ITV, 9pm) Return of the show focusing on amusing gaffes, bloopers and mishaps from the world of TV. Hosted by Griff Rhys Jones. Luke Kempner's Impression of 2015 (ITV2, 9pm) The impressionist looks back on the most memorable events of 2015. The Millionaire Party Planner (Channel 4, 10pm) Documentary focusing on Liz Taylor, party-planner to the rich and famous. ★ TFI Friday: New Year's Special (Channel 4, 7.30pm) Guests are Quentin Tarantino, Kurt Russell, Will Poulter, Sia, New Order, Olly Murs, the Vaccines, Izzy Bizu & Alex Jones. Hosted by Chris Evans. Panda Babies (ITV, 8.30pm) Wildlife special where vet Steve Leonard travels to China to meet baby pandas. Alan Carr's New Year Specstacular (Channel 4, 9pm) Guests are David Guetta, Danny Dyer, Mel B, Greg Davies, Katherine Ryan, Kelly Brook, Nish Kumar, Ellie Goulding, the Vamps, and more. The Graham Norton Show (BBC1, 10.45pm) Guests are Jennifer Lawrence, Mark Wahlberg, Will Ferrell, Eddie Redmayne & Years and Years. Jools' Annual Hootenanny 2015 (BBC2, 11.10pm) 23rd NYE special. Guests include Hozier, James Bay, Paul Weller, Tom Jones, Jess Glynne, KT Tunstall, and more. Bryan Adams Rocks Big Ben Live (BBC1, 11.30pm) The American rock star helps the UK ring in 2016 with a live performance from central London. Top of the Pops: New Year's Special (11.55am) Special episode of the pop show to celebrate the dawning of 2016, with guests The Vaccines, Sigala, Jess Glynne, the Vamps, Grace, The Maccabees, Ellie Goulding, James Bay, and more. Billionaire Boy (BBC1, 7pm) Family comedy-drama adapting the David Walliams children's book, about a 12-year-old boy and his father who become super-rich after inventing a new type of toilet roll. Starring John Thomson, Catherine Tate, David Walliams, Rebecca Front, James Fleet, Elliot Sprakes, Warwick Davis & Bryn Terfel. 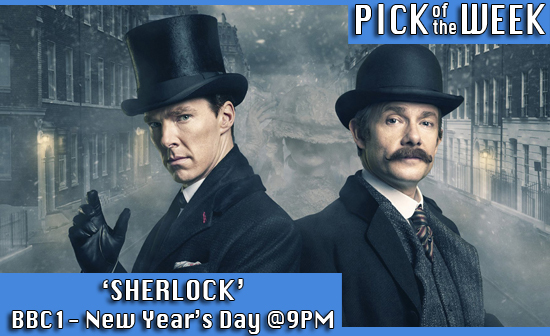 ★ Sherlock (BBC1, 9pm) Return of the detective drama, with a special episode set during the Victorian era. Starring Benedict Cumberbatch, Martin Freeman, Una Stubbs, Rupert Graves, Mark Gatiss, Louise Brealey, Amanda Abbington, Tim McInnerny & Catherine McCormack. The Big Quiz: Coronation Street vs. Emmerdale (ITV, 9pm) Quiz show on the year's events, with the cast of two soaps competing. Bruce's Hall of Fame with Alexander Armstrong (BBC1, 6pm) Return of the show where Bruce Forsyth asks various celebrities to pay homage to his idols. Owing to ill health Alexander Armstrong is hosting instead. Guests are Catherine Tate, Kimberly Wyatt, Adam Garcia, Beverley Knight, Katherine Ryan, Shona McGarty & Britain's Got Talent runner-up Jamie Raven. Ninja Warrior UK (ITV, 7pm) Series 2 of the physical challenge show. Hosted by Ben Shephard, Rochelle Humes & Chris Kamara. Take Me Out (ITV, 8pm) Series 8 of the dating gameshow. Hosted by Paddy McGuinness.